Saw another movie with my wife! This time it was San Andreas, the earthquake disaster movie. The movie was excellent, if predictable. I’ve seen a decent amount of disaster movies and this one did not break the mold. It’s just very good within that genre. The plot of the movie is pretty simple. A series of earthquakes rock the West Coast. 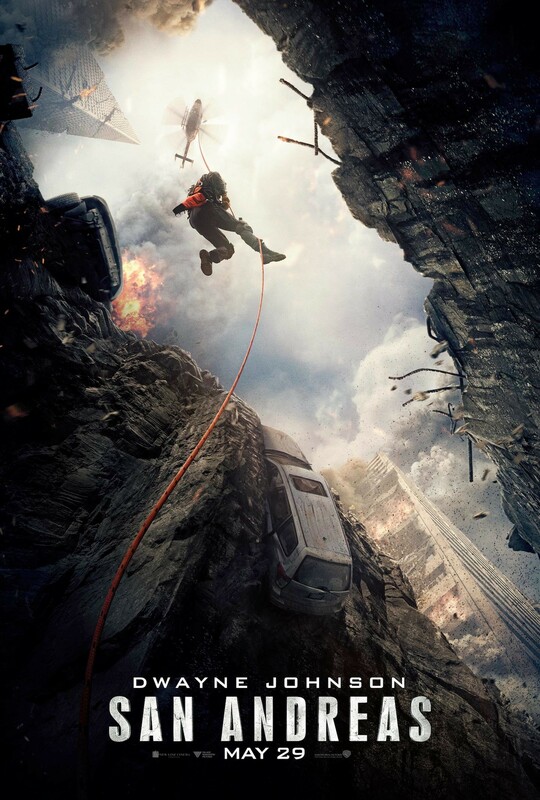 Ray, a rescue worker played by Dwayne Johnson, must rescue his daughter and separated wife and get them to safety. We’ve all heard that before but the movie introduces it so well. After an action scene at the start of the movie, Ray goes home and calls his daughter. He invites her out to dinner while opening some mail. She declines dinner saying that she already has plans with “Mom and Daniel.” Ray looks disappointed but doesn’t let it come out in his voice as he finishes the phone call and the camera pans down to the divorce papers that he opened. We instantly know almost everything about that family dynamic. Daniel is the mom’s new boyfriend and Ray is trying to not let it bother him. Ray then goes upstairs and looks through some old photos and gets really sad when he comes to a photo of him his wife and two daughters. Two daughters? But we’ve only seen one in the movie! Ah… that’s because the other one is dead. You get all this information very quickly in the movie and it’s all given to you organically. No one had to mention the dead daughter. No one had to mention the divorce. Those are just things that the audience knows now, just as the characters know them. That flawless characterization continues through the rest of the movie along with a bunch of awesome earthquake rescue stuff. Ray pilots a helicopter, drives a truck, stops looters, flies a plane, parachutes, sails a boat through a tsunami, and looks amazing doing it. His wife, Em, played by Carla Gugino, manages to keep her hair looking fabulous while helping (seriously, her hair never lost its curls or got dirt in it). The rise and fall of action is fairly predictable. “Wow! That was intense! Are they safe? NO!” repeats over and over. Alexandra Daddario plays the daughter, Blake, who takes care of two English brothers she finds in San Francisco before the quake hits. Blake also slowly gets sexier as the movie goes on. She loses her outer shirt first, then she gets sopping wet, followed by a few down the shirt shots. Despite all the awesome stuff in the movie there are two glaring errors I have to mention. First, the movie says that Bakersfield is 90 minutes from San Francisco by helicopter. This is only true at max speed for helicopters. The helicopter in the movie would’ve run out of gas before they made it to SF. Ray and Em should’ve known this and planned for it. Second, one of the English brothers gets a large shard of glass stuck in his leg. Blake decides they need to remove it so they can keep moving, which is about the stupidest thing you can do in this situation. They do a dirty job of bandaging his leg, but he probably needed a tournequit, not a bandage. He continues to remain active through the rest of the movie. Even giving his younger brother a piggyback ride and swimming. All while mysteriously not bleeding out due to his untreated injury. Em is also injured during the movie and that cut on her head conveniently disappears by the end. Still, great movie I’d recommend it especially to Californians. This movie has everything that we’re scared of about the big quake that’s overdue. And you get to see the Golden Gate destroyed which was awesome and heartwrenching at the same time.